When the First Lady of the United States comes to town, it requires almost as much planning and fanfare as a visit by the President. As First Lady, Nancy Reagan was dedicated to spreading her anti-drug message across the world, often travelling alone. As part of that effort, she and fifteen members of her entourage had a private meeting with Pope John Paul II for 25 minutes on May 4, 1985 in the library of his residence in the Apostolic Palace at Castel Gandolfo. Anything can happen during dignitary visits, and FSOs must be prepared. Michael Boorstein, an administrative officer on a temporary duty assignment to Rome and the Holy See, tells of his involvement in Nancy Reagan’s visit to the Vatican in 1985, and about the presidential helicopter that almost didn’t make it. He was interviewed by Charles Stuart Kennedy in September, 2005. Please follow the links to read more about high-level visits, Pope John Paul II and about the Reagans. I finished my two year assignment as the post management officer for Mexico, Central America, and Panama, and in April of 1985 I heard that our Embassy to the Holy See was in need of some help because Nancy Reagan was going to take a side trip to Rome and the Vatican in connection with the G7 Summit which was being hosted by Germany. Okay, well, I can tell you a couple of very interesting stories because it was a wonderful experience. I went out under orders from the Bureau of European Affairs rather than the Office of Support for Presidential and Vice Presidential Travel, so I was an asset for the European bureau, and the reason was that our embassy to the Vatican was fairly small. It only opened I think a year or two beforehand. The ambassador’s name was William Wilson, was a very close friend of Ronald Reagan, a very wealthy real estate developer from Southern California and a Catholic, obviously. He was the ambassador to the Vatican. He was the first ambassador since we established relations in recent times. Apparently, the administrative officer was kind of burned out and so the European bureau wanted to send someone to help the little embassy with all the details related to the Vatican portion of Nancy Reagan’s visit. As I spoke Italian from my earlier tour in Palermo, I was asked to go, and so I went out the middle of April, roughly two, two and a half weeks before Nancy Reagan arrived to help the embassy with their planning. 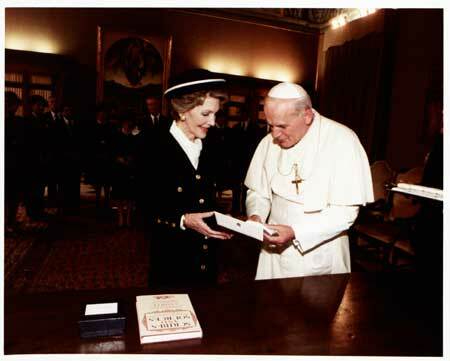 Nancy Reagan’s visit was both to Italy and to the Holy See, and while she was there she had an audience with the Pope. She visited a drug rehabilitation center south of Rome, and she gained access to it by taking the helicopter to Castel Gandolfo, the Pope’s summer residence, using the helicopter-landing pad there, and then the motorcade was going to then take her into Italy, to the drug center and return. I ended up working with the Secret Service and the White House advance people and the political officer, Lou (Louis J.) Nigro, from the Embassy to the Holy See, on just the overall planning. I spent a lot of time in the Vatican dealing with their protocol people, going back and forth to other meetings in Embassy Rome where there was coordination and I really was the key — almost the interpreter — for the head of the Secret Service. It was a fascinating three weeks for the planning stages. 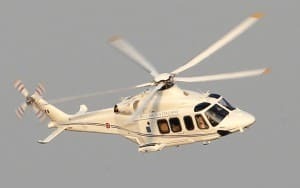 The one particular thing that I will always remember is that we got the Italian helicopter and the crew that normally is used to transport the Pope. That was being offered to transport Nancy Reagan. We did a trial run of the route. We met up with the helicopter on the rooftop of the Quirinale, which is the president’s office building in Rome, and then we flew from there down to Castel Gandolfo and then back to Ciampino Airport. So, the day that we did this was just a spectacularly beautiful day, hardly a cloud in the sky, and I had this aerial tour of ancient Rome that you couldn’t buy. I probably could have chartered a private helicopter for a couple of thousand dollars to do, but I got it free of charge. 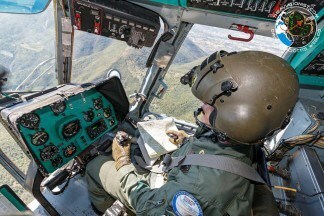 I remember sitting in the Pope’s seat on the helicopter and it was neat…. The other thing that was kind of neat in the planning was that we got into the Sistine Chapel before it was open to the public…. On the day of the actual visit, I went down with the motorcade fairly early in the morning to get the motorcade all into position for Nancy Reagan’s arrival by helicopter to Castel Gandolfo and going off to this drug rehabilitation center. We get to Castel Gandolfo and out of the blue these two or three Jeeps show up that are part of some SWAT team that was assigned in the case of any attack against Nancy Reagan, or if she fell unexpectedly ill, they were there to form some sort of a defensive perimeter, or whatever. This had never been discussed with anybody in the embassy at the Vatican, certainly not with the Vatican protocol people. They just showed up. I had to sort of negotiate them being part of the motorcade. These were U.S. [Jeeps]. I don’t know whether they were part of the Secret Service or they were military that were seconded to the Secret Service, but we just had no warning that these guys were coming and I think they had weapons. It came as a bit of a surprise certainly to us and of course to the Vatican officials, but they were allowed to stay. We had fundamentally such good relations with the Italians and with the people in the Vatican that it was not an issue. 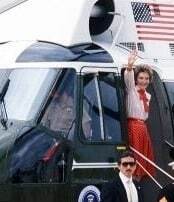 Nancy Reagan flies in and gets off the helicopter, goes immediately to the motorcade and the motorcade whisks off. I stayed with the helicopter crew just to be there while they were off on this event and waiting for them to come back. Well, out of the blue the young major, I think that was his rank, the commander of the helicopter, says that he was going to take the helicopter to fly to Ciampino to top off his tanks because after he returned Nancy Reagan to Ciampino Airport in Rome he had to ferry some Italian admiral down to Naples. With several of the protocol people from the Vatican and this Italian flight crew and me, we flew back to Ciampino near Rome, and of course, this defensive group was with the motorcade and basically, nobody else was left in the landing pad at Castel Gandolfo. We land at the air base. Ciampino is adjacent to Leonardo Da Vinci Airport and it is used a lot for charter flights, but it basically has a military component. Because there were officials from the Vatican on this helicopter, the protocol officer from the airfield greets the helicopter, invites everybody in for a drink while the flight crew is doing its thing. I went with them and I didn’t have any alcohol. I had a Coca-Cola and I’m looking at my watch. Pretty much on time, the major came back and said that they were ready to fly back. We fly back. We land back in Castel Gandolfo and literally as the rotors are still going around, they’re slowing, the motorcade arrives about five minutes early and I thought to myself, you know, there but for the grace of God, had we been a little bit later the motorcade could have literally have arrived with no helicopter. Those are the kind of things that get people fired from the Foreign Service. Fortunately the gods were with me. It didn’t happen. Nancy Reagan and her chief of staff and the others in the entourage were totally oblivious to this. Got in the helicopter and off they went and I stayed on the ground because I was going back with the motorcade. As the helicopter is taking off I’m standing right in front of it within seeing distance and the major gives me this big smile and sort of does like this and I almost wanted to give him an obscene gesture in Italian, one of these, but I refrained and sort of shook my fist back at him and I smiled, too, because after all it all worked out.